So You Think You Can Mom? : Bubblefest XV at the Discovery Science Center! Bubblefest XV at the Discovery Science Center! The 15th Anniversary of Bubblefest runs April 2 – 24, 2011. Bubblefest is the ultimate Spring Break family event, featuring the exclusive Mega Bubble Show. The Mega Bubble Show is a high-tech combination of art and science, lights and special effects brought to Southern California by bubble artists and world record-holders, Fan Yang and son Deni Yang. Both Fan and Deni will perform throughout the event. World-renowned for their unique and stunning artistry, the Yang Family will perform four MegaBubble Shows daily (11:00am, 12:30pm, 2:00pm, 3:30pm). The Mega Bubble Show highlights bubble carousels, bubbles within bubbles, smoking bubbles, spinning bubbles, bouncing bubbles and bubbles in all shapes and sizes. 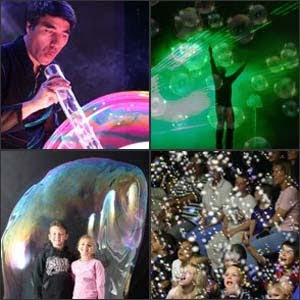 Mega Bubble Show tickets are an additional charge of $5 for DSC members and $7 for the general public. Check the website for performance schedules and package details. Bubblefest is included with general admission to Discovery Science Center from April 2 – 24. The annual event offers science learning stations in the Bubble Lab, bubble blowing fun at the Bubble Courtyard and new bubble-busting exhibits! Bubble science activities demonstrate surface tension, elasticity, air pressure, geometry and more. Don’t forget to revisit the Center’s more than 100 permanent hands-on exhibits and 4-D Discovery Theater! Also offered during Bubblefest is the "Me in a Bubble" experience, where guests can have their photo taken inside a giant soap bubble! “Me in a Bubble” is an additional fee of $12 for DSC members and $15 for the general public. I've been looking forward to this since I heard about it last year! Can't wait!